Meadow Pointe’s a quiet community designed around a "village" concept, and it’s close to major employment opportunities, cultural events, shopping, restaurants, health care & hospitals and small business centers. Located between I-275 and Bruce B. Downs Boulevard in Pasco County, Meadow Pointe community is nestled just over the Hillsborough county line in southern Pasco County. Meadow Pointe offers several site and floor plans of single family two to four bedroom homes and townhomes ranging in all price ranges. The University of South Florida and Tampa International Airport are also nearby, while Disney World, Epcot, Sea World, Universal & MGM Studios and the area’s famous white-sand beaches are just over an hour’s drive away. © Copyright 2005. Terms used to find Meadow Pointe Real Estate, Wesley Chapel Real Estate, Meadow Pointe Homes for sale, Wesley Chapel Homes for sale, Meadow Pointe Realtor, Wesley Chapel Realtor, Meadow Pointe buyers agent, Wesley Chapel buyers agent, and Wesley Chapel communities are not exclusive to the Meadow Pointe community nor the city of Wesley Chapel, FL. Search Meadow Pointe Real Estate for Sale provided by real estate agents and home builders. 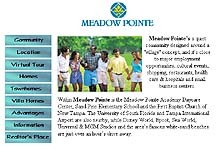 Meadow Pointe homes for sale include resale homes, condos, and commercial property.